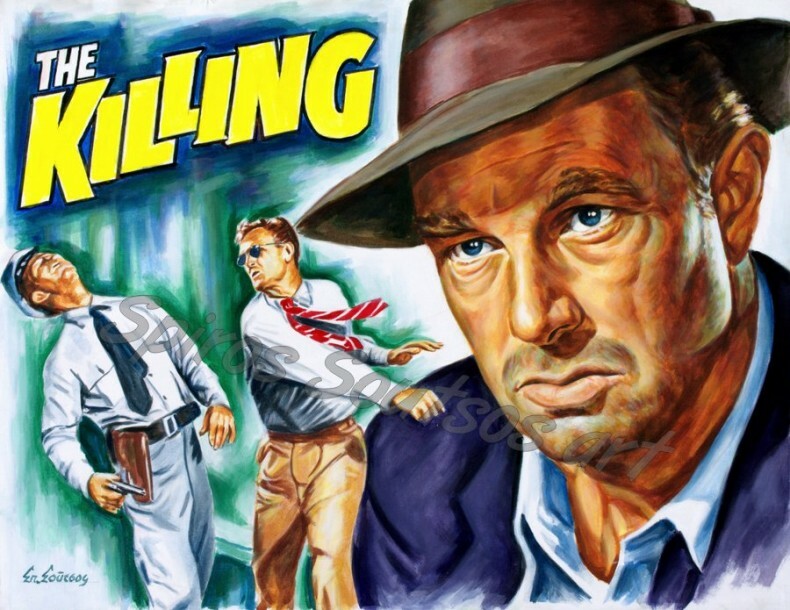 The Killing (1956) is a classic film noir produced by James B. Harris and directed by Stanley Kubrick. It was written by Kubrick and Jim Thompson and based on the Lionel White’s novel Clean Break. The drama features Sterling Hayden, Coleen Gray, Vince Edwards, Marie Windsor, Ted de Corsia and Elisha Cook Jr.
Johnny Clay (Sterling Hayden) is a veteran criminal planning one last heist before settling down and marrying Fay (Coleen Gray). He plans to steal $2 million from the money-counting room of a racetrack during a featured race. So he assembles a gang consisting of a betting window teller (Elisha Cook Jr.) to gain access to the backroom, a corrupt cop (Ted de Corsia), a sharpshooter (Timothy Carey) to shoot the favorite horse during the race to distract the crowd, a track bartender (Joe Sawyer) and a wrestler (Kola Kwariani) to provide another distraction by provoking a fight at the track bar. Sterling Hayden was paid $40,000 for his lead role as a gangster, while initially Jack Palance and Victor Mature were both considered for this role. Stanley Kubrick took no fee as director of the film. The total budget for the film was $320,000. United Artists put up $200,000 and he rest was raised by producer James B. Harris. This was a paltry budget for a feature even by 1950s “B” picture standards. Frank Sinatra expressed interest in this project, but production rights were granted to Stanley Kubrick first. Kirk Douglas was so impressed with this film that he sought out the director for his next project, Paths Of Glory (1957) anti-war masterpiece.